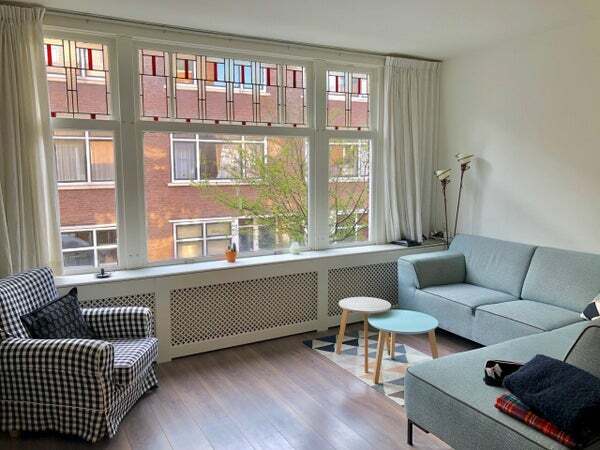 Very nice, light and neat upholstered three-room apartment on the first floor in the cozy and much loved district of Blijdorp. Ideally located in a quiet street with ample parking space in the street (parking permit possible) less than 10 minutes from the center of Rotterdam and Central Station by bike and within walking distance of the Blijdorp metro stop (line E Randstadrail The Hague-Slinge-Central Station), the bus stop for bus lines 44 and 33 (Rotterdam AirPort) and the stop of tram line 25 (including Rotterdam Central Station). In addition, the A13 and A20 motorways can be reached within a few minutes. Furthermore, the Vroesenpark, the supermarket, various shops and nice restaurants are also within walking distance. Layout: first floor, spacious corridor, in which there is a large cupboard with washing machine connection on the left and also space for storage, and a modern toilet. From the hallway there are two glass doors at the front and back that give access to a very spacious and light l-shaped living room with open kitchen. The lovely kitchen is equipped with an electric hob, extractor hood, oven and a fridge. Adjecent to the kitchen there is a small balcony. Via the stairs you reach the third floor where the master bedroom is located with an adjacent balcony, a small bedroom and the bathroom. The bathroom is equipped with a shower which has an aluminum sliding door, a washbasin, a design radiator and cupboard space. The entire house has a laminate floor. Furthermore, the house has authentic details such as stained glass windows. Particulars: The shed in the garden of the neighbors below can be reached via a back entrance, of which a part (1/2) for example can be used for placing bicycles. The property is not suitable for students.